Manipal Hospitals, India’s leading healthcare provider today announced the launch of its World Heart Day campaign “Guardians of Heart” in Bengaluru. 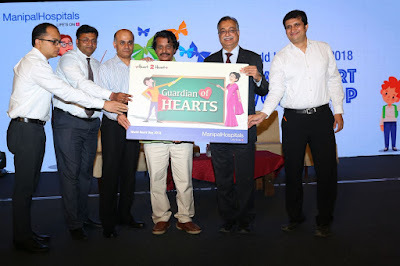 A unique collaboration of two signature days in September, World Heart Day and Teachers Day, the campaign aims at creating 25000 ‘Heart Smart Teachers’ to create awareness on Cardiovascular Disease (CVD) among younger generation. The corporate campaign will be rolled across various centres of Manipal i.e. Vijayawada, Mangalore, Goa, Jaipur and Dwarka ( New Delhi). This unique crusader was unveiled by T N Seetharam, Kannada Film & TV Actor, Director, Producer in the presence of Dr. Sudarshan Ballal, Chairman, Manipal Hospitals. India is diabetic capital of the world and we are steadily progressing towards becoming the capital of heart diseases as well. The disease needs to be handled at grassroot level and education & awareness needs to be created amongst the younger generation. Hence, to connect the dots, Manipal aims to explore possibility of changes that teachers can bring about in students, who in turn can pass the message to their families. “Heart smart teachers will spread healthy heart concepts to kids who in turn will educate their parents and the chain reaction of Heart Smart Teachers - Healthy Kids - Healthy Family - Healthy Nation can be achieved,” he added. Heart disease can be reduced by Educating, Inspiring, Motivating and Regular checkups. Under the Guardians of Heart campaign, a comprehensive health programme will be conducted to make this campaign a success. Heart Smart passes and family health cards will be distributed. 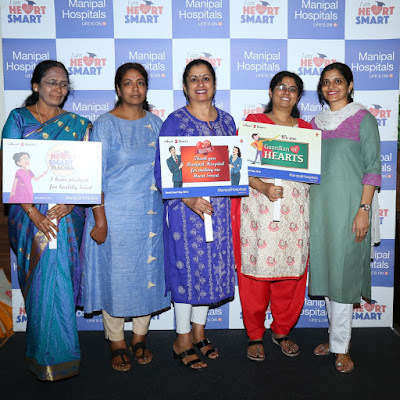 Every last Saturday, Teachers would be attending educative workshops and Manipal will facilitate unique series of candid interactions with Cardiac super specialists who will be educating Teachers about various heart medical emergencies faced and how best it can be addressed. Culmination of this program will take place on Feb 1, 2019 on National Red Day where 25000 teachers will avail the certificate to become Heart Smart.